Black Currant is a tangy fruity aroma. Black Currant (Ribes nigrum) is a shrub in the family Grossulariaceae grown for its piquant berries. Bunches of small, glossy black fruit develop along the stems in the summer and can be harvested by hand or by machine. The fruit is rich in vitamin C, various other nutrients, phytochemicals and antioxidants. The fruit of black currants can be eaten raw, but its strong, tart flavour requires sweetening to be palatable. It can be made into jams and jellies which set readily because of the fruit's high content of pectin and acid. 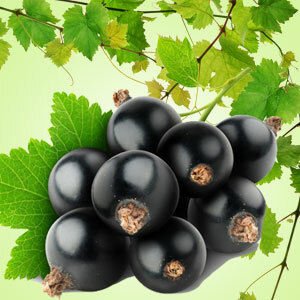 Black Currant is native to northern Europe and Asia. It was in cultivation in Russia by the 11th century when it was present in monastery gardens and also grown in towns and settlements. Cultivation in Europe is thought to have started around the last decades of the 17th century. The medicinal properties of the plant have been noted in various herbals and traditional names included quinsy berry and squinancy berry.